College-oriented roommate matching service app. We've heard lots horror stories about bad roommates-- we want to end these horror stories and turn finding a random roommate into finding a friend. 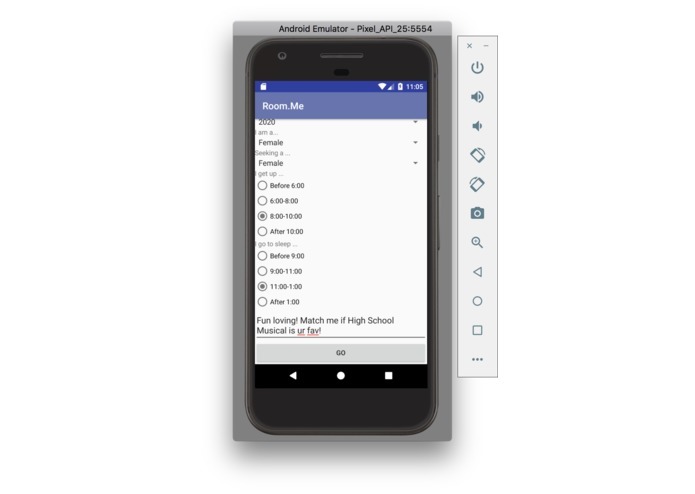 Many first-year students at Pitt use Facebook to find roommates, but it is essentially a one-way match-- you can't know that you both are compatible. 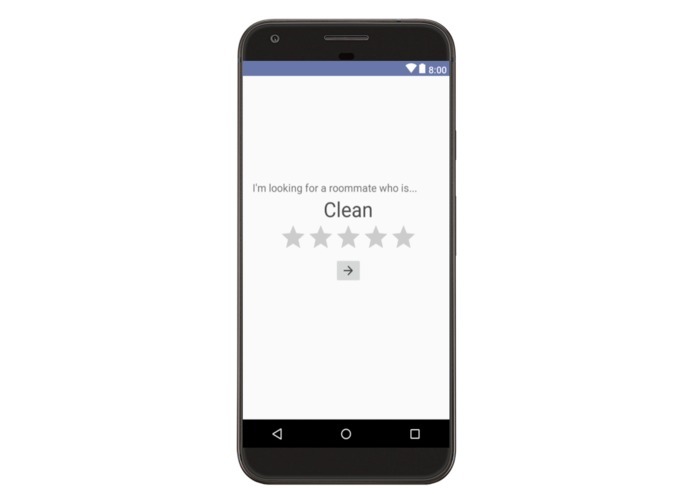 When users first log in to the app, they fill out a questionnaire about themselves and about what they are seeking in a roommate. It then presents them with profiles that fit their criteria. Users then can check yes or no, and if both click yes, they're a match. Matches can then exchange contact information. We used Android Studio, which integrates Java code and XML markup. Most of the team was unfamiliar with version control software, and we had to get used to sharing code as a team. None of us had created an app or been to a hackathon before, and we made a functional user interface and mock-ups of future features. We experienced the design process as a team, including taking into account the needs of the user and making decisions about the app. Finally, we applied our knowledge of Java from classes to a project in real life. We learned how to use Android Studio and test our app's interface on an emulator. We gained a better understanding of why apps are set up the way they are. In addition, we learned to break down tasks and distribute them among team members. We'd like to develop more features, including facilitating social interactions between potential matches, as well as reaching a broader audience, including apartment-hunters and subletters.